Genius inventors/style consultants tend to be in short supply. Bruce Wayne has Lucius Fox. But thanks to a sleek new storefront in the Leather District, you now have a team of MIT grads who would like to outfit you in some high-tech office threads. Presenting the Ministry of Supply Showroom, the first brick-and-mortar retail store for the Massachusetts-based futuristic dress-shirt purveyor, opening by appointment this Friday. Inspired by an actual government inventor during WWII (who inspired Q and worked under cover of the Ministry of Supply), this is like your very own Bond shop housed in an old leather-manufacturing building from the 1800s (with the original floors and company vault still in place). 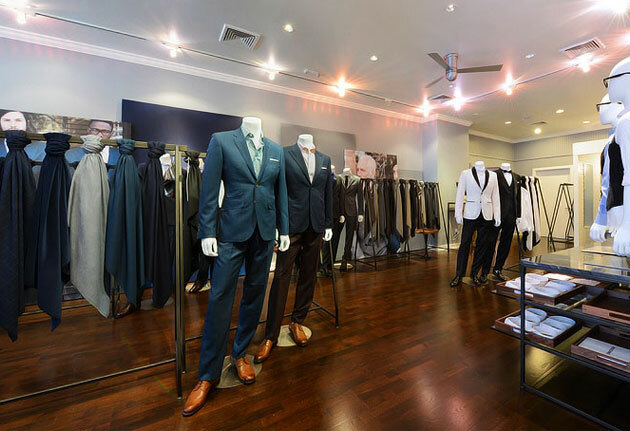 You’ll set up an appointment, make your way here and browse through the line of dress shirts and athletic tees shimmering on display. Our pick: the Agent button-down, which employs special fabrics originally designed for NASA that absorb heat and moisture while storing coolness in its fibers (think: Under Armour athletic wear, for the office). Or there’s also the Atmos tee, worn under your suit or by itself, with four panels of the NASA-y fabric seamlessly woven into areas of high heat/sweat. Yes, your armpits are two of them.